No matter what your health concern, you can find new hope for chronic illness and disease with South Africa's number one Regenerative Medical Specialist. 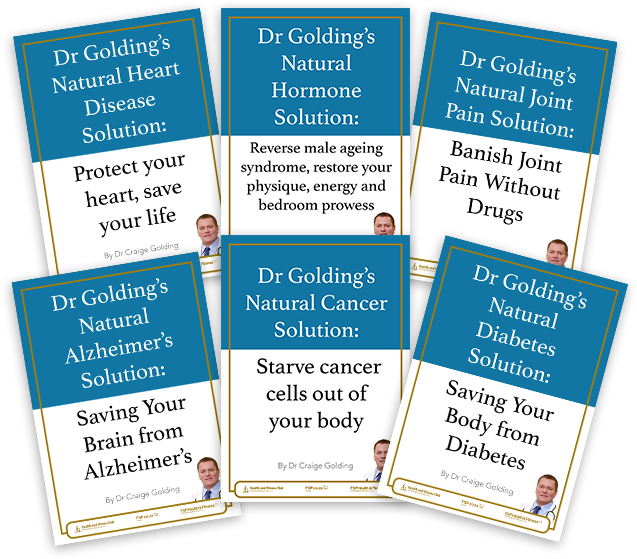 Every month, Dr Golding's goal is to bring you the most promising and exciting breakthroughs in modern natural medicine to help you understand how they can benifit you and your family. 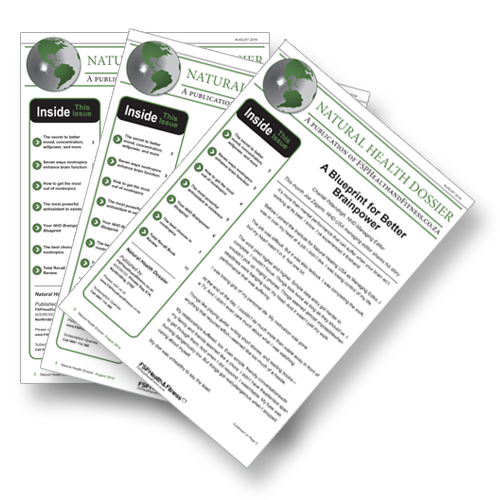 Whether it's chronic disease or an everyday illness that's plaguiging your health, Dr Golding's monthly issue of Natural Health Dossier provides simple and immediately actionable steps to target the underlying cause of disease. Lorraine Boshoff is just one of Dr Golding’s diabetes patients who’s been given her life back. Her blood sugar levels where through the roof at 9mmol/L (normal levels range between 4.4 and 6.1 mmol/L). Most days, she couldn’t even get out of bed. But within two weeks, her sugar was back to 5.6mmol/L. Her energy levels were back to normal and her eyesight stabilised. Would you believe that an extract from cinnamon, a cannabis flavanol and an ancient Cherokee herb could treat diabetes in just a few weeks? 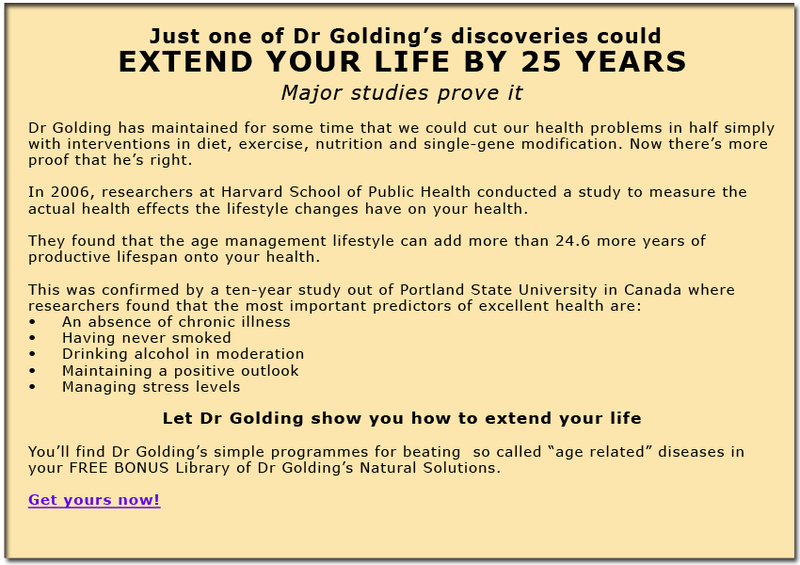 This may sound like an outrageous claim, but other natural doctors like Dr Golding have been using the same treatments for over 20 years. That’s just the tip of the iceberg, Dr Golding has treated over 8,000 cases with ZERO return of diabetes. As well as cases where cancer, arthritis and heart disease have been reversed. Yet most people don’t know about it! You see, more than 1.9 million new cases of diabetes are diagnosed every year. This same formula, which is so safe and effective it can even be used as a substitute for insulin and to correct insulin resistance, is not prescribed by your GP. He may not even be aware of it. Yet it’s non-invasive, non-toxic and so easy to use, you can do it at home. Simple as adding a teaspoon to your morning and evening cup of tea of coffee and taking a vitamin or two. So how come you never saw anything about this diabetes breakthrough… Not in magazines… Not on TV… Not even on the Internet? Because of modern medicine’s “golden rule” – those with the gold make the rules. And this astonishingly effective diabetes treatment has just one unfortunate drawback. But Dr Craige Golding would like to send you all the details in a brand-new FREE report: Saving Your Body from Diabetes. It’s included with your FREE library of Natural Solutions that he’s got for you. 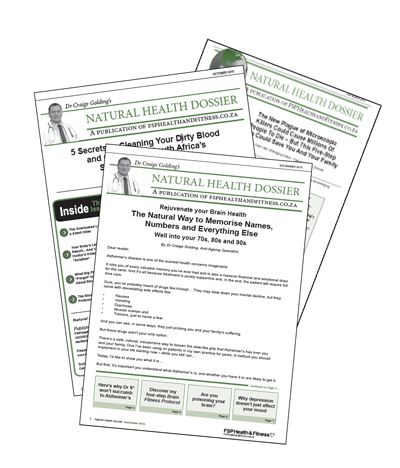 Revealing hundreds of equally safe, natural and effective secrets for a healthier, longer life. 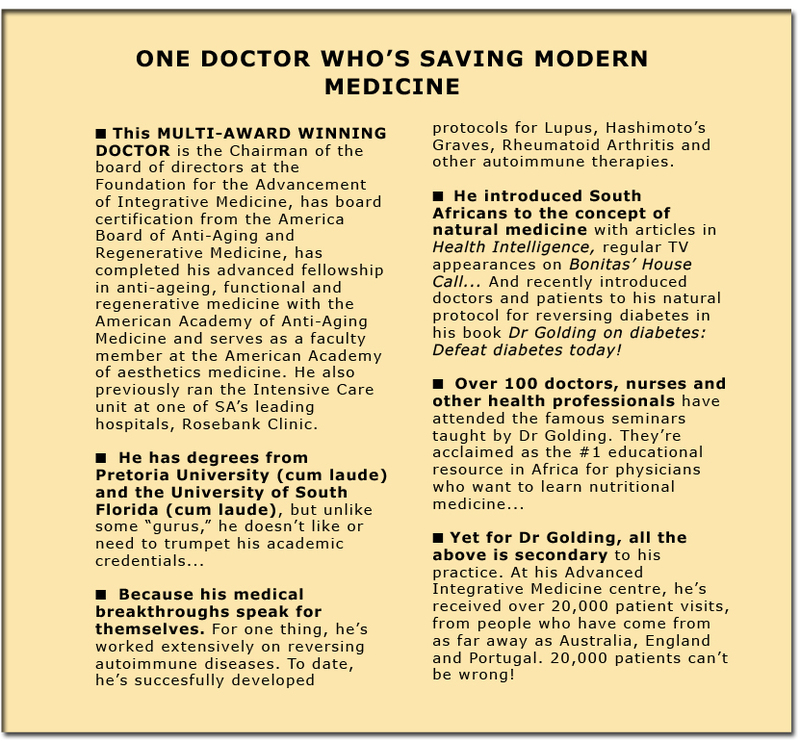 In South Africa, some call him a “genius” in alternative medicine. 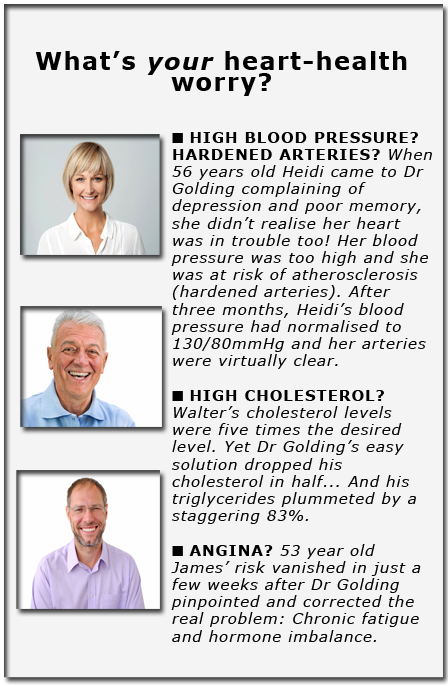 To date, over 100 forward-thinking doctors have sought Dr Golding out for advice and guidance in seeking natural therapies for health problems that have defied drugs and conventional treatments. Lorraine's just one of Dr Golding’s cases. But why wait that long? JUST SAY YES now and I’ll be pleased to send you 5 FREE BONUS GIFTS detailing all of Dr Golding’s most valuable breakthrough treatments. When 66 year old Walter walked into Dr Golding’s office, he was in trouble. He’d been suffering from ischaemic heart disease for more than five years. Despite following a conventional medicine treatment plan, Walter was only managing his symptoms. To find out what was causing them, Dr Golding ordered a series of blood tests. His triglyceride reading was off the charts at 15.41mmol/L. His heart could fail at any time. 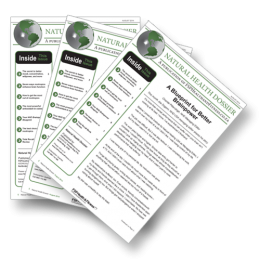 You can get the full details of Walter’s nutraceutical programme in your FREE BONUS copy of Dr Golding’s Natural Heart Solution: Protect your heart, save your life. After living with crippling Rheumatoid Arthritis for over 30 years, Jolene had taken just about every over-the-counter and prescription chronic anti-inflammatory, steroid and pain reliever out there and for the past two years, her doctor had administered a Revelex drip once every eight weeks. Still, her hands were so deformed even simple daily tasks were impossible. By tackling the cause of her arthritis – not just treating her pain – three months into Dr Golding’s treatment plan, Jolene stopped Revelex treatments and went off her chronic medication. Today, she uses just one ingredient in Dr Golding’s original treatment plan. It helps her do the things she loves – garden, knit and even play ball with her dogs – things she hasn’t been able to do for over 30 years! You can learn more about Jolene’s treatment in Dr Golding’s Natural Joint Pain Solution: Banish Joint Pain Without Drugs. 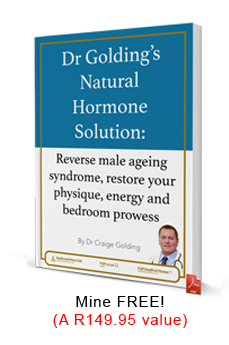 Get Dr Golding’s FREE BONUS Library of Natural Solutions. When Kay got the news that she had CCL (chronic lymphocytic leukaemia), she was glad her Will was ready. Choosing not to follow conventional treatments like chemo, she asked Dr Golding for an alternative way to make her last years peaceful. Kay’s just celebrated her 75th birthday. Why wait in the pain wracked past? In November 2013, the Department of Health together with the Medicines Control Council gazetted changes to the General Regulations of the Medicines Act to regulate complementary medicines. Under this gazette, most vitamins and minerals are now classified as drugs. Except for multivitamins of trivial potency, other supplements are banned from over-the-counter sale. Yet under this directive, many of these natural vitamins, minerals and enzymes have been swept off the shelves and locked away as dangerous prescription drugs. And free the incredibly healthy human being that’s locked up inside of you! In it, you’ll get the full benefit of his latest research into natural treatments and alternative remedies to fight cancer, alzheimer’s, diabetes and other ailments and disease.